Cowboys & Gangsters Wear Sensible Sandals ← You Want Me To Wear What? Sandals haven’t undergone much invention since their creation back by some guy who was sick of stepping on rocks while hunting mammoths. The last great innovation for the sandal was the jelly shoe, and that was only great because you could hose them down when they started to look gross. But now, in the 21st century, a new age has dawned. 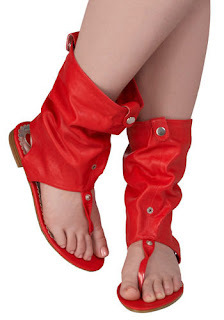 Behold, The Spatsdal – have spats, half sandal. Or, if your rain dance is feeling a little under-accessorized, the moccasandal.